The kind folks here gave me the week off for Thanksgiving and things were looking up. We started putting Christmas decorations up at the house (the Star Wars tree will go up this weekend), I spent most of Thanksgiving break playing board games with my son, and I am in the home stretch this semester. Then I read Chew. 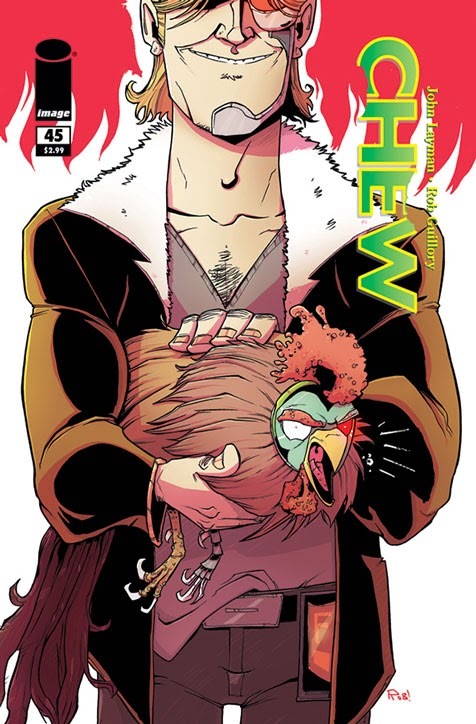 Chew #45 - Well, John Layman just ruined Christmas. Sorry Virginia, but there isn't a Santa Claus because he would never allow something like this to happen. I knew that nobody was safe and that Layman wasn't scared to pull some major punches, but this one is below the belt. Maybe if I put my fingers in my ear and say "lalalalalalala" I can pretend it didn't happen. Maybe issue #46 will open with this character, looking sharp with Patrick Duffy hair, taking a shower and we will learn this is all a dream. I know in the bottom of my heart this isn't true and these last five issues are going to be soul-wrenching, but this was just too cruel. The only good that came out of this issue was a nice Kool-Aid gag and the best sounding lasers in the business. Still, I feel as if I have had a "pyeoom, pyeoom!" right in the gut. Curse you Layman!!! Birthright #3 - Josh Williamson and Andrei Bressan's exciting fantasy tale continues this week as Mikey is beginning his epic quest back in this world. Utilizing some impressive magic he was able to escape from the police and rejoin his father and brother. It appears that his mother can see through his tricks, but regardless, he sets on his quest to slay the five escaped criminals from his world. This series is a good to look at as it is to read. Bressan, colorist Adriano Lucas, and letterer Pat Brosseau do a marvelous job in the juxtaposition of fantasy and reality. The effect is stunning and I am oddly reminded of the live action Masters of the Universe movie. In a good way. 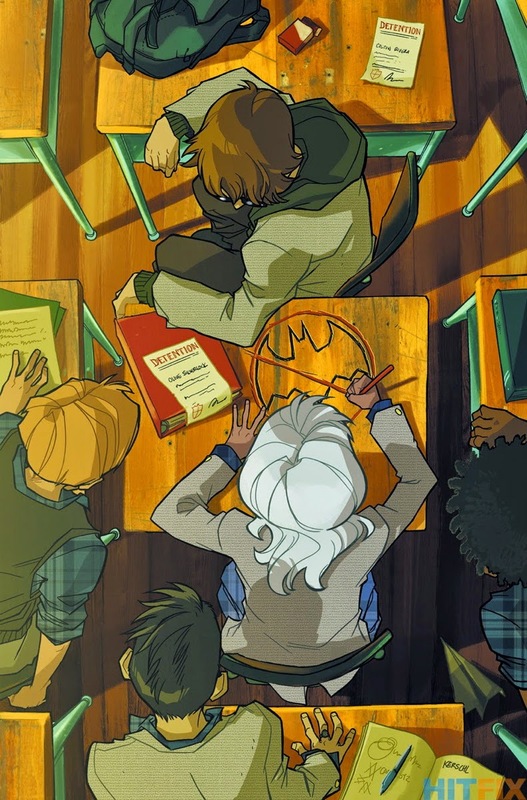 Gotham Academy #3 - This series just continues to be plain fun. If it could avoid being as bad as Gotham, which wouldn't be too hard, it would be a perfect fit for television. My wife is a big fan of the high school drama shows like Dawson's Creek and The O.C. (I swear it's her!) and this would fit that genre well. It would have amazing cameos considering all of the colorful characters that populate Gotham and would hook a lot of readers if it were as well written as this series. The ghost hunt was both entertaining and horrifying. I love the pacing of this series. It provides insights into the characters that attend the school while maintaining a focus on the story that the issue revolves around.